In 2015, we released a course on Entrepreneurship and New Venture Strategy for technology-driven businesses. All videos are available for free on Youtube and Coursera in English, French and Mandarin. Links to the Coursera course in the English, Mandarin and French versions (click on the preferred langauge). Take the full course for free on Coursera and earn the chance to win $2,500. More info here. The original goal behind our course Launching New Ventures, was to provide a broad overview of entrepreneurship. Each week, we collected resources in French and English which would allow learners to discover more about each week's topic. We are still adding new resources to each week, so let us know in the comments if there is a resource that you found very useful. Book chapter: Baron, R.A. & Shane, S.A. (2005) Entrepreneurship – A field and an activity, in: Entrepreneurship – a process perspective, chapter 1, pp. 2-26. Gruber, M. (2004) Marketing in New Ventures: Theory and Empirical Evidence, Schmalenbach Business Review, Vol. 56, pp. 164-199. Kim, W.C. & Mauborgne, R. Creating new market space (HBR, Jan-Feb 1999, 83-93). Book chapter: Lodish, L.M. et al. (2001) Positioning, Targeting, and Segmentation, in: Entrepreneurial Marketing, chapter 1, pp. 1-16; Summary of the book on pp. 237-243 (chapter 13). Tessmann, T. Why are you running a crowdfunding campaign? June 17: How to raise and manage money? 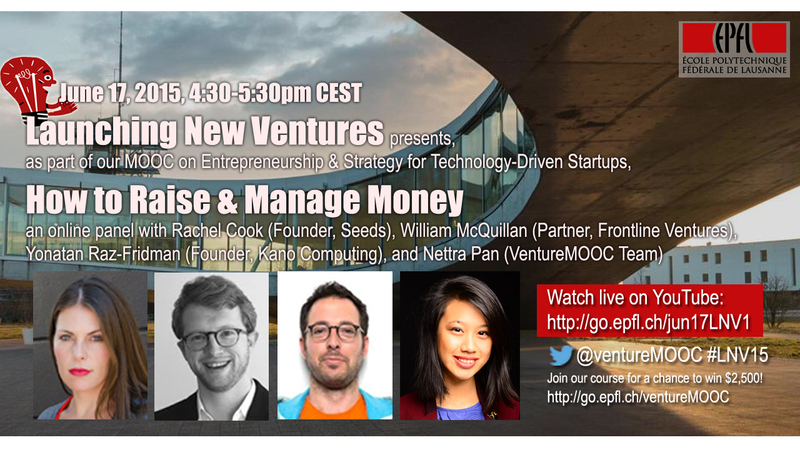 Join us on the 17th of June, 2015 at 4:30pm CET for an exciting panel on how to raise and manage money with Rachel Cook (Seeds), William McQuillan (Frontline.vc), and Yonatan Raz-Fridman (Kano Computing); entrepreneurs and investors with experience bootstrapping, crowdfunding and investing in startups. The panel will be streamed live on Youtube. It can be viewed below or at go.epfl.ch/panel4LNV15 between 4:30pm and 5:30pm CET/CAT. Send us your questions in real time via twitter using the hashtag #LNV15, or send them to us in advance through Coursera (link to our Coursera course here). Entrepreneurship is about bringing resources together to create value. After providng that value can be created, funding is needed to run and scale the operation. Depending on the industry, client and technology, more financing may be needed for successful market entry. Hear from entrepreneurs about how to raise money (what are VCs and crowds looking for in a pitch? ), how to manage the money that you have, and how to manage investor relations. As part of the EPFL College of Management’s new MOOC, Launching New Ventures, we will host a free, online discussion with three experts and our Venture MOOC teaching staff Nettra Pan. Rachel Cook is the founder of Seeds, which converts freemium gamers into paying players through in-game microloan purchases. She is a former Futures/Equities Trader and the director/producer of The Microlending Film Project, a feature documentary that explores the impact of microloans on women living on four continents. The filmmaking team included Emmy and Grammy nominees. Rachel is a graduate of Duke University and lives in Brooklyn, New York. William is a Partner at Frontline Ventures. He was the Co-Founder and CEO of Osmoda.com, an online sales platform targeting some of Europe's top emerging fashion brands. Prior to this he was one of the founding employees of Ondra Partners, a start-up investment-banking boutique. Ondra grew from a four-person team to being a profitable company, working on some of the largest mergers and acquisitions in Europe and having over 40 people in London, New York and Paris. He is passionate about entrepreneurship and currently is the London Ambassador for the Thousand Network, for which he has organised over 40 events in the last 2 years. He is also a mentor for Springboard and Imperial Incubators in London, and is a Startup Leadership Program Fellow. He is passionate about entrepreneurship and currently is the London Ambassador for the Sandbox Network, for which he has organised over 40 events in the last 2 years. He is also a mentor for Springboard and Imperial Incubators in London, and is a Startup Leadership Program Fellow. Yonatan is the Founder and CEO of Kano, a computer than anyone can build. Kano rasied over over $1.5 million through its Kickstarter campaign last year, passing their goal of $100,000. Kano announced Series A funding of $15 million this year, including $500,000 open to community backers on the equity crowdfunding platform Quire. View their story: kano.me/about. The more people tuning in, the more interesting the discussion. Share this page with your network! Export the event to your calendar: here. Join us on the 10th of June, 2015 at 4:30pm CET for an exciting panel on how to make the most of your crowdfunding campaign with Chris Tucci (EPFL), Eric Migicovsky (Pebble), and James McBennett (Timbertail). The panel will be streamed live on Youtube. It can be viewed below or at go.epfl.ch/panel3LNV15 between 4:30pm and 5:30pm CET/CAT. Send us your questions in real time via twitter using the hashtag #LNV15, or send them to us in advance through Coursera (you must be registered for the course). At some point in the entrepreneur's journey you will have to convince investors about the potential of your venture. Today, many entrepreneurs can use crowdfunding platforms for more visibility (especially among early adopters!). Crowdfunding can also increase sales, and cash flow... essential for production or further tests and survival... Some entrepreneurs see crowdfunding as a risk-free way to test initial reception of their idea! But is crowdfunding really risk-free? Even after you raise money, how do you keep the crowd from turning into an angry mob? As part of the EPFL College of Management’s new MOOC, Launching New Ventures, we will host a free, online discussion with three experts and our CDM Professor Chris Tucci to talk about the Do's and Don't's of Crowdfunding. Chris is currently Dean of the College of Management of Technology at EPFL, where he holds the Chair in Corporate Strategy & Innovation. In addition to publishing in many of the highest ranked journals in the field of management, he won Best Paper of 2012 for his article “Crowdsourcing as a solution to distant search” in the Academy of Management Review, which is ranked the #1 scholarly journal in the categories of Management and Business. In 2013, he was elected to the Board of Governors of the Academy of Management, the largest professional society devoted to management research and teaching. Chris is among the most highly-cited professors in the field of innovation management and brings more than 30 years of experience working on cutting edge technologies and innovation. Before earning his PhD, he was an industrial computer scientist involved in developing Internet protocols. Johannes Gees is an artist and entrepreneur. He is the founder and CEO of wemakeit.com, Switzerland’s leading crowdfunding platform. After studying social anthroplogy and history at the University of Zurich, Johannes Gees started working as a picture editor for news agencies. He then became a self-taught graphic designer and art director, opening his own studio and working for large advertisting networks. In 1997 he joined Swiss publishing house Tamedia as an internet developer. In 2000 he founded johannesgees.com, a production company both for his own art projects and clients such as Expo.01/02., the Swiss government, Credit Suisse, BMW etc. In 2004 he cofounded the short-film platform www.agent-provocateur.ch. Johannes Gees, who had been working off and on as a painter, photographer and musician since his youth, became a full-time artist in 2001, when his collaborative media art installation "hellomrpresident" hit the WEF in Davos(www.johannesgees.com). hellomrpresident was followed by "the hello world project" (2003, Geneva/New York/ Rio de Janeiro/Bombay) and a series of public art installations, both in Europe an overseas. James is guided by a generalist curiosity and great enthusiasm for doing interesting projects. He is a designer who works primarily in wood selling his products at www.timbertail.com. Passionate about the intersection of entrepreneurship and design, he studied architecture at University College Dublin and the Architectural Association in London while taking additional courses in entrepreneurship at the London School of Economics and University of Cambridge. He successfully launched a product on Kickstarter called This Stool Rocks that recieved coverage in Wired, Forbes and Fast Company. After partipating in Startup Chile where he was nominated for their Highway Programme, he accepted an invitation to judge future applicants. Follow him on Pinterest, Twitter, Facebook and Linkedin. Le 3 juin: Quelle est votre proposition de valeur et comment capturer cette valeur? Rejoignez-nous le 3 juin à 15h-16h pour une discussion passionante avec Professeur Chris Tucci du College de Management de la Technologie de l'EPFL et nos chers intervenants Stéphane Degonde ("J'ose entreprendre ! "), Alexandre Castel (Station Energy) et Bibi Gnagno (OMG! I Love Your Hair!). Le panel est accessible en direct ci-dessus ou à go.epfl.ch/panel1LNV15 de 15h à 16h le 3 juin 2015. Envoyez-nous vos questions en temps réel par twitter, en utilisant le hashtag* #LNV15, ou, en avance, à travers la plateforme Coursera (vous devriez être inscrits au cours). Comment choisir l'ensemble des fonctionnalités de votre produit pour répondre aux besoins de vos futurs clients ? Pensez-vous que votre offre soit irrésistible et différente de celle de vos compétiteurs ? Et après avoir soigneusement développé votre offre : comment récupérer vos coûts d'investissement ? Comment convaincre vos clients d'acheter un produit qu'ils n'ont jamais utilisé? Dans le cadre de Lancer une startup, le nouveau MOOC du Collège du Management de la Technologie à EPFL, nous avons convié deux experts entrepreneurs et professeur Christopher Tucci pour une conférence exceptionnelle sur comment créer des produits utiles, attractifs et profitables. Inscrivez-vous à notre cours dès maintenant! Chris est actuellement le doyen du Collège du Management de la Technologie de l’EPFL où il est également à la tête de la chaire « stratégie d’entreprise & innovation ». En plus de ces nombreuses publications dans les meilleurs journaux dans le domaine du management, Chris a reçu en 2012 le prix du Meilleur Article dans l’Academy of Management Review pour son article intitulé « Crowdsourcing, la solution à la recherche éloignée » (« Crowdsourcing as the solution to distant search »). Cette revue est classée numéro 1 dans la catégorie Management et Business. En 2013, il a été élu au conseil des gouverneurs de l’académie de management, la plus grande entité professionnelle dédiée au management aussi bien pour la recherche que pour l’enseignement. Chris est parmi les professeurs les plus fréquemment cités en termes d’innovation dans le domaine du management. Il apporte plus de 30 ans d’expérience acquise dans les domaines de la technologie de pointe et de l’innovation. Avant d’obtenir son doctorat, il travaillait dans l’informatique industrielle et plus précisément dans le développement de protocoles internet. Comment les entreprises peuvent utiliser le crowdsourcing dans leur processus d’innovation. Fondateur & Président de Station Energy Services. Il est un Ingénieur (Mines de Douai) spécialisé en système de management et processus de création de valeur. Il a réalisé diverses missions relatives aux modes de consommation et à l’accès à l’énergie en Afrique (Burkina Faso, Sénégal, Angola) avant de se spécialiser en management du développement durable et Social Business à HEC Paris. Il est le fondateur de l’entreprise Station Energy. Le Groupe Station Energy (www.station-energy.com) conçoit, finance et installe des solutions innovantes d’accès à l’énergie et aux services de base pour les zones reculées d’Afrique Subsaharienne (Sénégal, Côte d’Ivoire, Burkina Faso et Comores). Station Energy a développé des solutions de micro-infrastructures « clef en main » alimentées par l’énergie solaire pour les zones rurales et péri-urbaines : centrale solaire, pompage pour l’irrigation, chambre froide solaire et boutiques multiservices « sur-mesure ». Stéphane Degonde tient également le blog "Une vie d'entrepreneur : Réussir contre vents et marées" sur le site de L'Express/L'Entreprise et rédige des chroniques pour Harvard Business Review. Bibi Gnagno est une consultante et coach qui offre aux jeunes femmes des outils et des ressources pour leur permettre de poursuivre leurs rêves autant dans leur vie personnelle que professionnelle. Bibi Gnagno est diplômée de Smith College, New York University, et NCCU School of Law où elle a obtenu le titre de Juris Doctor. Bibi vit actuellement à Abidjan en Côte d'Ivoire pays où elle a passé sont enfance. Elle travaille avec le ministère de la justice en Côte d’Ivoire, financée par une bourse du Fulbright-Clinton Fellowship. Bibi a rencontré l'entrepreneuriat après avoir créé un blog: OMG! I Love Your Hair!. Elle a lancé son entreprise après avoir rencontré tant de personnes, surtout des femmes, qui voulaient trouver un équilibre entre leur vie personnelle et professionnelle. OMG! I Love Your Hair! propose une gamme de produits de beauté naturels et africains, et mène des ateliers sur la santé et le bien-être. Bibi a auparavant travaillé comme juriste au sein de Kilpatrick Townsend & Stockton LLP, Atlanta, Georgia et l'International Center for Not-For-Profit Law. En tant qu'avocate, elle a participé à la fondation d'une entreprise LLC en Afghanistan. Quand vous publiez un commentaire sur Twitter et vous ajoutez la phrase "#LNV15", votre message serait publié sur cette page. Donc vous pouvez voir tous les messages liés au sujet "LNV15" (i.e. LNV15 fait référence au nom du course en anglais "Launching New Venture 2015") . En utilisant le bon hashtag, Twitter se transforme en salle de conférence virtuelle et permets des discussions liées au même événement. Vous pourriez également suivre les discussion liées à un sujet, e.g. #startup. Comment utiliser un hashtag? Un article plus long en anglais ici. Launching New Ventures Live in 10 Days!